Kumar, a graduate student in computer science, and a group of other students created a simple shopping assistance application for a project in Gerontechnology in Smart Home Environments, a course taught by Carl Chang, professor of computer science. Chang researches software engineering and smart technologies, which has applications in smart aging. For the project, Kumar consulted with adults in assisted living centers to ask about their concerns and consider how smart aging research could benefit older adults. A common problem expressed by senior adults was difficulty navigating through a grocery store to find the items they need. Kumar and his teammates used data from Hy-Vee’s website to create a simple application that allows the user to search a store database for items. By searching for a term such as “apple,” the application returns all the available items in the store that matched. For “apple” that would include items such as apples, apple juice and applesauce. The list would be displayed with enlarged images that are easy to see. The user can then select the items to create a shopping list. 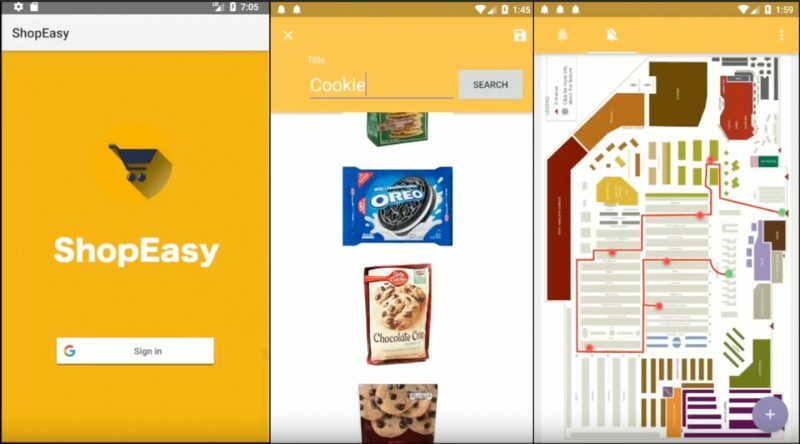 After the shopping list is created, the user swipes to start navigation and the application produces a map of the best route through the store, locating where to pick up the indicated items along the way, ending at the checkout. The application can suggest additional items to add based on your list and match them with recipes on Epicurious, the largest online database of recipes. Food allergies and other medical conditions can also be added to the application so that certain items will not be suggested. Kumar said the application was successful but still has room for improvement. The application still needs to be adjusted to work with more stores. Though the team didn’t have time to implement all the ideas, future semesters of the class will continue the research.